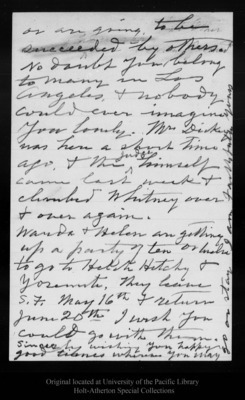 Letter from [John Muir] to Ellie [Mosgrove], [ca. 1903 May 10]. Original letter dimensions: 20 x 12.5 cm. University of the Pacific Library Holt-Atherton Special Collections. Please contact this institution directly to obtain copies of the images or permission to publish or use them beyond educational purposes.